If you are marketing essential oils you’re going to hear some questions about diffusing essential oils. Here are some questions your prospective customers may ask you and some really good answers! 3) Why is a Terra Cotta Pendant the best necklace diffuser to use? There are many different ways you can diffuse essential oils. You can put the oils directly on your skin, you can put them on your sleeve or collar, you can use a room diffuser or you can put them on personal diffuser jewellery made with terra cotta clay. What’s the difference? Here’s a fun way to prove this! Use the Rating Form to measure the difference between how you feel when you are diffusing essential oils and how you feel when you are not. #3 A Terra Cotta Pendant the best necklace diffuser to use. It gives you a choice of over 85 different designs allowing you to express a unique part of your personality! It is earthy; matching your skin so it goes with everything you wear! It is an all-natural product; just terra cotta and waxed cotton cords. You can apply a different oil every few days and after a while you will create an ever-changing signature aroma made up of your favourite essential oils! It is made with love right here in North America – Stoney Creek, New Brunswick, Canada to be exact! Did I mention the Free Terra Cotta Pendant you receive with your first order? Details on this page! They get people started with the oils right away by giving them an inexpensive and simple way to diffuse the oils! They can help you recover the cost of Workshops and Health Shows when you sell them to participants! Terra Cotta Pendants help you educate your customers on the benefits of diffusing! Purchase Terra Cotta Pendants at Wholesale when you purchase just 25 or more! They make practical Welcome Gifts to new customers! They are powerful incentives for encouraging prospects to sign up! Use them as Achievement Gifts to acknowledge the successes of those in your downline! They can be combined with samples of oil for Door Prizes and Hostess Gifts! Terra Cotta Pendants are conversation starters! They make the oils visible! Diffuse essential oils on a Terra Cotta Pendant when you do meetings, workshops and Health Shows to support, uplift and energize you! Use Terra Cotta Pendants with the Rating Form to demonstrate the value of essential oils to your prospects! 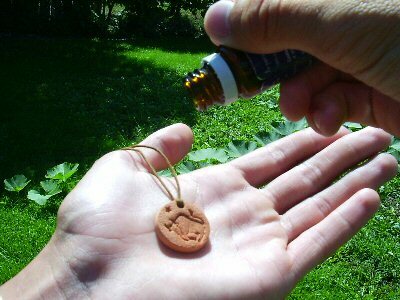 diffusing essential oils with a Terra Cotta Pendant! ©2009 Terra Cotta Pendants About the Author: Lori Gosselin has worked in network marketing since 1997. In 2003, this passion led to the creation of www.Terra-Cotta-Pendants.com This is one in a series of Business-building Tips for marketing essential oils. See more helpful articles here!